The hockey stick Larry Kwong once held in his able hands has been replaced by a cane. The legs on which he once dazzled opposing defenceman have been replaced by artificial limbs. The loss of a limb is never easy, the cruelty all the greater for a former athlete. Mr. Kwong once skittered on the ice like a doodlebug on skates, a slight, shifty forward whose well-being depended on his ability to avoid a bodycheck. The sportswriters called him King Kwong, a cheap pun and a subtle dig at a diminutive scorer who could stretch along the red goal line and still leave plenty of room for a puck to squirt in at either end. In his playing days, he stood 5 foot 6 (in skates, on tiptoe), and weighed just 150 pounds (after a heavy meal). Of course, he says, he is shorter now. The loss of both legs below the knee will do that. He remembers when the doctor gave him the bad news. Poor circulation in the left leg – the one he had used for so many years to power sharp turns to the right – meant it had to go. He spent 14 weeks recuperating in hospital. He returned the following year. The right leg had to go. For the past two years, a man who played hockey in four countries and in three provinces and on two continents has been teaching himself to walk. He vows to be using but a single cane by the end of the year. The goal he has set for himself is as simple as it is daunting. Mr. Kwong has beaten long odds all his life. Sixty year ago, on March 13, 1948, in the cramped visitors dressing room at the old Montreal Forum, he slipped a blue sweater over his thin frame, the number 11 on its back, the letters RANGERS spilling across the chest. Little Larry Kwong, who had been born in Vernon, B.C., one of 15 children, who fell in love with hockey by listening to the radio in the apartment above the family's grocery store, who, in fact, carried the name of the store – Kwong Hing Lung (Abundant Prosperity) – rather than the venerable family name of Eng, was about to make his National Hockey League debut. He spent the entire first period at the end of the bench. He spent the entire second period at the end of the bench. He spent most of the third period at the end of the bench. Finally, coach Frank Boucher gave the signal. Mr. Kwong leaped over the boards. His shift lasted about a minute. He returned to the bench. 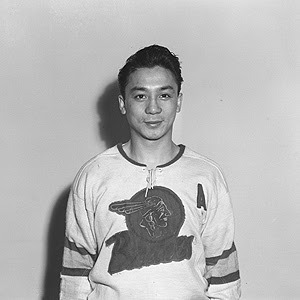 The first player of Asian ancestry to skate in the National Hockey League had launched – and, though he did not yet know it, ended – his major league career. He never got another chance, not even to sit on the bench. Last weekend, he watched on television as Willie O'Ree was honoured on the 50th anniversary of his becoming the first black player in the NHL. Mr. O'Ree endured sticks and elbows from his rivals, as well as taunts from opposing fans. His recognition is welcome and overdue. He qualified for the Smokies prior to the 1941-42 season. The players were unpaid, though the great reward of making the team was a guaranteed job at the smelter that gave the team its name. As it turned out, there was no position for a player named Kwong. The club found him a post as a hotel bellhop, a position not only servile but paying far less than the industrial wage to be had beneath the smokestack. He enlisted in the army. Asked what he did during the war and he will reply that he “fought the battle of Wetaskiwin,” the Alberta camp where the little corporal shot pucks, not bullets. Another season at Trail, in which he helped win the Savage Cup as provincial champions, led to an invitation to a tryout camp for amateurs held in Winnipeg. The Rangers signed him. From dingy rinks in industrial towns, he graduated to Madison Square Garden in Manhattan as a prospect with the New York Rovers, a Rangers farm team. After he was snubbed, he left the Rangers organization to sign with the Valleyfield Braves in Quebec. The Braves were a talented team, winning a championship in 1950-51 under the tutelage of coach Toe Blake. Mr. Kwong won the Byng of Vimy trophy as most valuable player. Mr. Kwong played for a season in England with the Nottingham Panthers, which led to a job as a playing coach in Switzerland, where his club played at an open-air arena in the Alps. He eventually joined his brother in operating the Food-Vale grocery store in Calgary. At 84, his days are filled with exercise, lunches with cronies and events at the Rotary Club. He continues to work on his walking, a frustrating challenge for someone who was once so smooth on the ice. He played 16 years of senior and minor pro hockey. Unlike a scoring record, his legacy as the first NHL player of Asian ancestry can never be broken, bettered or taken away. It can only be ignored. As the 60th anniversary of his debut – and his swan song – nears, he has yet to hear from his old team the Rangers, nor from the Calgary Flames in the city in which he lives, nor from the Vancouver Canucks in the province of his birth and in which he got his start. Like the long night when he waited expectantly on a bench at the Forum, he again waits for a call that may never come. Had things worked out, had bureaucrats not changed their minds, had negotiations been fuller and motivations made more clear, the concert behind bars likely would have been a smashing success. Inmates could have enjoyed a respite from their tribulations. A Canadian would have re-created some of the spirit of one of the greatest live recordings in popular music. In doing so, a son would also know more of his late father. Instead, most everyone is singing the Folsom Prison blues. “It was going to be a beautiful event,” Jonathan Holiff said from his mother's home in Nanaimo. The cancellation left him in tears. Last week, state authorities rescinded permission, leaving prisoners disappointed and Mr. Holiff enraged. He feels the proposed show was cancelled due to the “gross incompetence” of officials with the California Department of Corrections and Rehabilitation. Mr. Holiff, 42, had not yet celebrated his third birthday when a prison cafeteria became a temporary stage for the Man in Black. 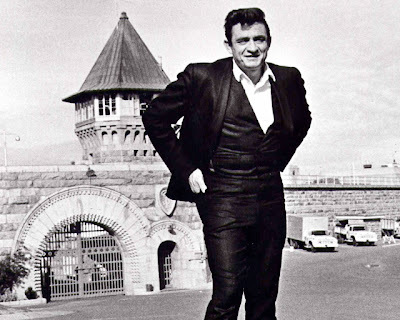 The concert was recorded and released that summer as Johnny Cash at Folsom Prison. It remained on the rock and country charts for years, reviving a career in danger of being extinguished by drink and drugs. Mr. Cash was managed at the time by Saul Holiff, Jonathan's father. The manager envisioned the rockabilly star playing Carnegie Hall instead of small clubs. He brought June Carter into Mr. Cash's show, and during a performance in his manager's hometown, Mr. Cash announced on stage his intention to marry her. Little Jonathan grew up in a world of comic book heroes, not all of whom were two dimensional. Over time, though, he realized Mr. Cash was responsible for his father's many absences. Saul Holiff resigned as Mr. Cash's manager in 1973, tired of the star's unpredictable behaviour and certain his popularity had peaked. Father and son had a falling out that was not resolved before the senior Mr. Holiff's death – “at a time of his own choosing,” as his funeral notice delicately stated – in 2005, aged 79. His parents' apartment held no evidence of their time in the music industry, during which their clients had also included Carl Perkins, Tommy Hunter and the Statler Brothers. However, his mother gave him a key to a storage locker containing boxes of letters, handwritten song lyrics, and gold records, including a 45 rpm for A Boy Named Sue. Inside one of the boxes he found reel upon reel of audio tape, including recordings of telephone calls between his father and Mr. Cash, as well as memorandums and daily musings, more than 60 hours of material. He decided to produce a book and a documentary feature to be called My Father and the Man in Black. While working on the documentary, he befriended Folsom warden Matthew Kramer and suggested the concert. The night before the 1968 concert, a preacher had visited Mr. Cash at his motel with a tape including a song written by an inmate doing five-to-life for armed robbery. After listening to the song, the singer wrote the lyrics in a notebook. He then played Greystone Chapel. “A house of worship in this den of sin,” he rumbled, as inmates cheered. After his release, Mr. Sherley had a performing career, before dying, perhaps by his own hand, in 1978. Mr. Holiff tracked down Mr. Sherley's son for the anniversary show. Mr. Holiff is out $50,000. He is upset that the four non-profit groups that were to share in the proceeds of the concert will do without. He is disappointed to not be able to entertain the prisoners. Richard Pecoraro filled in the penultimate oval before slipping the paper into its envelope. The ballot listed alphabetically eight candidates vying to be the Democratic nominee for president of the United States. “Snow White and the seven dwarfs,” he said. Snow White would be Hillary Clinton. As for the others, two have since dropped from the race, with more to follow. For whom did Mr. Pecoraro vote? Happy would be Barack Obama, the smiling senator from Illinois, whose feel-good rhetoric has turned a long-shot candidacy into a remarkable phenomenon. At 74, the retiree does not fit into the youthful demographic that is threatening to overturn decades of conventional wisdom about presidential politics. The presidency of George W. Bush seems to many to have been such a fiasco that a fresh approach is needed, even if the specifics of change remain unclear and the champion of change untested. “Why am I for Obama? I immediately knew that he was the man I wanted.” Mr. Pecoraro made a few false starts in trying to explain his choice. After a long career as a mechanical designer in the aerospace industry, followed by a stint as a salesman for Pitney Bowes, the company that introduced the postage meter, Mr. Pecoraro retired to Victoria 20 years ago. He has been here long enough to refer to Canadians as “us” and “we” and to Americans as “them” and “they.” He's even figured out the parliamentary system. As an independent, the former California resident is allowed to vote in the state's Democratic primary. He made his choice for president and voted in seven referendums. The envelope promised paid postage but only if mailed in the United States, so he went to the post office for a 93-cent stamp. It was a small price to pay for democracy. Besides, he had already made a $400 donation to his candidate, the first time he has ever sent money to a politician. Politics used to be an in-person experience. A voter attended an all-candidates meeting, waved a placard at a rally, tromped to the polls to cast a vote. Now, a voter trolls partisan websites, watches speeches on YouTube, casts a ballot by post. The hustings is as near as the closest computer screen. 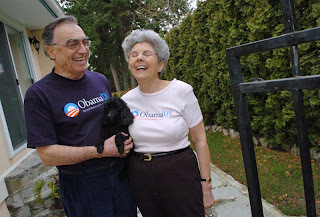 Mr. Pecoraro even ordered his-and-hers Obama T-shirts online for himself and his wife, Elizabeth Murray, a Canadian. His is navy blue, hers white. Mr. Pecoraro is taking part in a political campaign miles removed from his home in the suburban Broadmead neighbourhood. His ballot won't be counted until Feb. 5 when the California primary is held, a day so crowded with caucuses and primary elections that it has been dubbed Super Duper Tuesday. The likely presidential candidates for both major parties are expected to emerge from the day's battles in 24 states. In Vancouver, a group called Democrats Abroad was to hold a meeting last night at a West End church, where they were to chew over the New Hampshire results and prepare for a primary of their own. The Democratic Party treats party members living abroad as though they were a state of their own. Democrats Abroad will be sending 22 delegates to the party's national convention in Denver, which opens Aug. 25. The group will have one more delegate than South Dakota and one less than Idaho. Democrats living around the globe can vote in person, by mail, and even online for their favourite candidate from Super Duper Tuesday until Feb 12. The results will be released 10 days later. The delegates will then be selected at a caucus to be held at a Vancouver hotel in April. Republicans living in Canada have to cast absentee ballots in the state in which they were last registered. The group Republicans Abroad Canada, based in Toronto, also promotes voter registration. As a voter unaffiliated with either party, Mr. Pecoraro cast an absentee ballot based on his former residence in Folsom, Calif. “I did a lot of years there,” he said jokingly of the city, not the prison for which it is best known. Mr. Pecoraro – “not Italian, Sicilian,” he says of his family name – was born in St. Louis, where his mother was as a department-store sales clerk, and his father and, later, his stepfather worked as truck drivers. He grew up near an Italian-American neighbourhood now known as The Hill, which produced two baseball catchers in Yogi Berra and Joe Garagiola. As a boy, he preferred baseball's successful Cardinals to the city's sad-sack Browns. He wanted to be with a winner. He has a concern about the campaign for which he makes a confession. “I have never voted for a candidate who won,” he said. Although born and raised a Catholic, he did not vote for co-religionist John F. Kennedy in 1960, preferring instead the more experienced vice-president, Richard Nixon, a California Republican. Mr. Kennedy won. Eight years later, Mr. Pecoraro could not again bring himself to support Mr. Nixon. Mr. Nixon won. In a campaign year in which old truths are being discarded like so many unwanted pamphlets, the unknown Pecoraro Curse might also be overcome. At low tide, the exposed shoreline emits an odour of iodine mixed with sulphur. A snootful is as crisp as smelling salts, clearing the sinuses and watering the eyes. The urge is to plug your nose. Not Tom Koppel. He inhales deeply. Mr. Koppel has spent many of his 64 years around the sea, chronicling the tale of the Hawaiian settlers of British Columbia (in his 1995 book "Kanaka") and surviving adventures in Indiana Jones fashion while tracing the route perhaps taken to this continent by prehistoric peoples ("Lost World"). A visit to the ocean was a rare treat in his early years, as he lived in a housing project in the Bronx. An annual seaside holiday introduced to him the natural wonder that is the subject of his latest book. For one glorious week every summer, young Tom cavorted on Star Island, one of the nine rocky Isles of Shoals in the Atlantic off the coast where New Hampshire squeezes next to Maine. At high tide, he splashed along the fringe where sea met land. At low tide, the defined shoreline gave way to a treacherous minefield of rock and barnacles, all covered by slippery seaweed. Mr. Koppel never lost the curiosity he held as a boy for a natural order that lifted an island's dock as much as four metres twice a day, and a lifetime's travel has led to an exploration of the phenomena in Ebb and Flow. He would learn the rise and fall of tides was not always slow-acting, nor especially benign. Some of the fastest tidal currents in the world can be found in British Columbia's waters. He first heard, rather than saw, the effects of Skookumchuck Rapids. Named “place of strong waters“ in the Chinook coastal jargon, the rapids' roar results from a majestic display of crashing waves and, nearby, “deep, gurgling holes,” all the chaotic result of tidal waters pressed into narrow inlets and channels, water gushing through a bottleneck. Overhead, opportunistic seagulls wait to pluck fish injured in the maelstrom. Mr. Koppel's book belongs to a new genre of non-fiction in which everyday items and natural phenomena too often taken for granted are explored in narratives combining science and history. They are usually presented with titles of monosyllabic definitiveness – “Cod” and “Salt“ and “Coal” – promising not so much a yarn as a dictionary entry. One of this season's entries is a tome on the humble toothpick, a sequel to the author's examination of the pencil. A veteran magazine writer, Mr. Koppel knows how to tell a story. In doing so, he is his mother's son. Mr. Koppel was the product of a mixed marriage in that his father's ancestry was German Jewish and his mother's Irish Catholic. His father, Edwin, manufactured tchotchkes such as toothbrush holders and other gift items and novelties. His mother, Margaret, known as Peggy, was a minor celebratory in their New York neighbourhood as the author of a weekly column about domestic life called Sugar 'n' Spice for the Bronx Press Review. Her death in 1958, at 52, warranted a news obituary in the New York Times. The family lived in Parkchester, a large planned community designed for working- and middle-class families. His parents were supporters of the pacifist Norman Thomas and his Socialist Party. (They were also early conservationists.) His father ran for a state assembly seat in 1937, losing to a Republican who would spend the next 27 years in the state capital. The elder Mr. Koppel would be asked to take his party's vice-presidential slot in 1956, an honour he wisely declined. Tom Koppel graduated with a bachelor's degree in 1966, a would-be architect who wound up specializing in economic theory, which he found too boring to sustain a working life. After completing a doctorate in political science in Russian and German studies, he became a translator for a news service, a job that allowed him to live wherever he wished. He chose the Gulf Islands, living on a shell midden on Prevost Island and in a lakeside log cabin on Salt Spring Island. He has travelled the globe, always returning to a place where nature provides a bounty. A page turns on the calendar. A year fades and another launches. We mark the occasion by lying to ourselves about improving bad habits. The possibility of our success is an unknown, human behaviour being measurable but not absolutely predictable. More certain is the continual rise and fall of the seas, an immutable law of nature and a timeless action that somehow comes with a timetable. So, in the waters near Mr. Koppel's Salt Spring home, the Canadian Hydrographic Service predicts a high tide of 3.6 metres will be reached at 11:21 a.m. today. A low tide of 1.1 metres will be met eight hours, eight minutes later. For those of you keeping track at home, that's a difference greater than Mr. Koppel's height. Eden Robinson was 10 when she first visited a spot on the British Columbia coast with which she will forever be associated. “I remember the whole beach was covered in broken shells. They crunched as you went,” she said, chortling at the memory. Ms. Robinson has a kindly laugh that rolls gently at the end of her sentences, like a soft wave lapping onto a beach. Her family had sailed down from Kitamaat Village to harvest shellfish. She made a return visit with her father two summers ago for the first time in years, bouncing along in a 3.6-metre boat with a 30-horsepower engine. The beach, of course smaller than she remembered from childhood, teemed with critters on the morning she arrived. She did not encounter the creature for which the beach is best known. The long tidal flats have long figured in Haisla cultural lore as a home of the Bekwis, which is pronounced bah-KWISS. Ms. Robinson has a better suggestion: “Just say ‘big wuss' really fast.” The Bekwis is a large, hairy creature known to some as “stick man” and to others as Sasquatch. The creature gave this place its name of Monkey Beach. It was an informal designation not to be found on official maps. That is, until recently. Monkey Beach is on the east side of Boxer Reach, a rare level spot on a mountainous peninsula set amid the archipelago that is so much a feature of the central British Columbia coast. Here, unnamed peaks drop precipitously to the sea. Jay Powell has studied the peoples of this area for much of his adult life, visiting isolated seaside hamlets while cocking a learned ear to the nuances of the local tongue. With his wife, Vickie Jensen, he has written dozens of schoolbooks in a variety of aboriginal languages. He is also responsible for many of the alphabets in use, in which ancient sounds are rendered in an English peppered by apostrophes, underscores and uncommon consonant combinations. If these can seem indecipherable to untrained eyes, imagine the difficulty in learning to speak languages in which some words begin with glotteral stops. The Haisla prize the shorelands for the rich selection of shellfish. Halibut, flounder and spring salmon are also plentiful. Since the resources have always been so bountiful, other tribes are welcome to share in the bounty with implied Haisla consent. The Haisla maintained a seasonal campsite at the north end of the beach, a site known as Q'wak'waksiyas. It was from here that the Bekwis were sometimes spotted. This is a bittersweet time for Prof. Powell, a professor emeritus of anthropology at the University of British Columbia. His hearing has begun to fail and he can no longer differentiate the 12 different pronunciations of K used in the aboriginal languages of the northwest. With each passing day, the opportunity to record myths and legends and even place names slips away, just as his own hearing fades with time. This year the B.C. Geographical Names Office adopted the designation Monkey Beach as an established local name. The professor's submission provided the proper background. Then, in April, the provincial government announced 2,699 hectares of land would be protected as the Bishop Bay-Monkey Beach Conservancy. Back in Kitamaat Village, on a night when snow fell and the lights flickered, Ms. Robinson was surprised to learn the beach's name had been officially acknowledged. It is, in some ways, an honour in which she shares credit. Instead, Zsuzsi Gartner, an acclaimed writer herself, asked Ms. Robinson to describe the story. She got as far as the setting before being abruptly stopped. Monkey Beach won a B.C. Book Prize and was nominated for both a Giller Prize and a Governor-General's Award. She says she has been told why the Haisla don't encounter the Bekwis as much as lore says they once did. Or perhaps they’re looking at the provincial gazetteer, where, at Longitude 53 degrees, 27 minutes, 31 seconds and Latitude 128 degrees, 56 minutes, 24 seconds, in a glorious seaside setting, an ancient home is officially on the map. The tracks of the Esquimalt & Nanaimo railway run behind Bruce Brackney's cottage. A train called the Malahat rumbles past twice a day. “Music to my ears,” he says. Mr. Brackney, 60, has long sported a mutton-chop beard. He dressed against the rainy-morning cold in a vest. Cufflinks with the crossed initials of the Southern Pacific railway are on his shirt. He looks like a conductor. Instead of calling out destinations, though, he picked up a guitar to sing a tune written by a good hobo friend who won't be able to perform the song in Canada any time soon. U. Utah Phillips's ticker has gone wonky. Again. The singing storyteller, the Will Rogers of trampdom who has been a legendary figure at music festivals for more than 30 years as the self-proclaimed Golden Voice of the Great Southwest, has been ordered by his doctor to desist. He can no longer ride the rails, nor hit the road. He has cancelled all his touring dates, including several in Canada. But if Utah can't play for the people, then the people will play for Utah. Fans declared December to be Utah Phillips Month. Mr. Brackney has helped launch a grassroots campaign to raise money for the 72-year-old poet and philosopher, a troubadour whose poor health has cost him his livelihood as he faces growing medical bills. In Toronto, folk singer Eve Goldberg raised $2,000 with a show at Hugh's Room on Monday. In Winnipeg, a benefit concert including the Duhks brought a hefty $7,000 on Saturday. The money and whatever else is donated in the coming weeks will be sent south by Mr. Brackney, who first met Mr. Phillips after a concert in Eureka, Calif., in 1976. The two free spirits hit it off, sharing not only a love of the railway but membership in the Industrial Workers of the World, the revolutionary union. Mr. Phillips and Mr. Brackney also formed a union of another kind in the Rose Tattoo, a gathering of like-minded musicians that is more social club than band. The initiates – “a motley crew, and far flung” – are branded with such monikers as Smokestack and Boomer Bob and Mama Pipes and Cream City Slim and the Feather River Kid. Utah is known as Bow Tie, while Mr. Brackney is called Haywire Brack. All bear a permanent ink-etching of a red flower. Haywire was tattooed many years ago in San Francisco by Lyle Tuttle, a renowned practitioner of the venerable if not always respectable art. Last year, the wandering musicians gathered around a campfire for 7 ½ hours of nothing but railway songs, not a tune repeated. Haywire has lived the kind of life in which he can say “my earliest memory is of an orphanage.” His parents were too poor to care for him, although he returned to them after a few years. As a young man, Haywire worked a placer gold claim in California. “I didn't mine much,” he said, “but it was an excuse to live in the wilderness and pretend it was 1876 instead of 1976.” He tramped from Minnesota by catching passing freights over the hump, often stopping in Spokane to visit Utah. Riding the rods is an experience he no longer recommends. One of his last rides was one of his most memorable. He and a buddy spotted a deadhead – “clean and empty” – in the yards and climbed aboard just as it pulled away in the predawn hour. Turns out the box car was not quite empty. The stamped metal floor had divots the depth of a golf ball sliced in half and each of those hundreds of small depressions was filled with ash from the volcanic eruption at Mount St. Helens. Luckily, they had kerchiefs to protect their noses and mouths. Haywire laughed at the memory, before picking up the phone to dial a number in California. On the other end of the line, Utah reminisced about performing at the Mariposa folk festival in Orillia, Ont., and at the Frostbite music festival in Whitehorse. 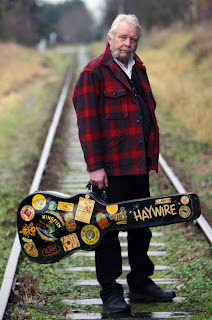 He talked about meeting veterans of the On-to-Ottawa Trek of the 1930s and he sang the praises of Stompin' Tom Connors. After having played so many benefits himself, and having joined striking workers on picket lines, he was asked what he made of being on the receiving end of generosity. Haywire doesn't know when next he'll see his old friend. When they do get together, guitars will be pulled out, old songs will be sung while old lies will be reworked to sound fresh. At Haywire's house, a room off the kitchen is closest to the tracks. Twice a day, display cabinets rattle as the Malahat passes. Haywire collects railway china, beautiful pieces that once rested on white linen tablecloths in fancy dining cars the insides of which a hobo like himself never got to enjoy.